We are proud to be mentioned in this amazing article “Last of the Moken” written by former guest and journalist Michael Shapiro for Islands Magazine! Michael came on the Surin Moken Experience last year to research the Moken and explore the beautiful islands of Koh Surin. The article does a wonderful job of portraying the Moken lifestyle and the current issues facing this community. It mentions that if you are seriously interested in learning more about the Moken and immersing in their way of life, you should take the 3 Days, 2 Nights Surin Moken Experience! 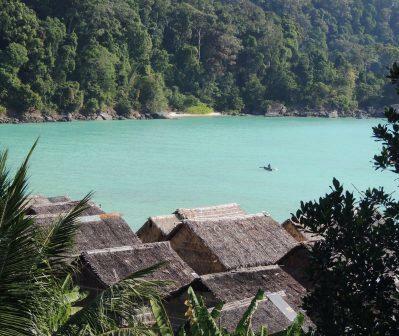 Guest can now experience the beauty of the Surin Islands with its original inhabitants through Moken guided tours! Since 2010, Andaman Discoveries has been working closely with the Moken community to host a community based tourism program. This private tour encompasses authentic Moken cultural activities, local environmental education and underwater experiences. Meander through the village as a Moken guide explains traditional boat making and basket weaving. Accompany your local guide on the Nature Trail to learn how the Moken’s seafaring life also depends on the forest. Then explore their deep connection with the sea as you snorkel with the Moken among the beautiful coral reefs. Guests traveling with Andaman Discoveries are asked to be patient, open-minded, and willing to accept new things. Please be aware that your presence makes a difference. In being interested in the Moken you empower them to be proud of their culture. Make sure to promote responsible behavior and only share the best parts of your culture.A Moken Tourism Group with the skill and integrity to provide these services has been established and received training. A variety of enjoyable activities, such as snorkeling, spear fishing demonstrations, and beach exploration, enable the guides to share their knowledge, Moken culture and way of life in a respectful way. I was there 2012 and visiting the Moken peaples after my weeks as a volontary worker in KuraBuri, and that was a wonderful adventure with Andaman Discoveries as the organisatier. This days gave me the most wonderful memories. A special Thanks to Karen Spackman at Andaman Discoveries.